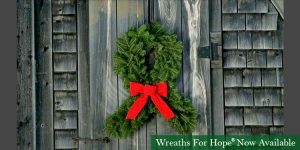 Wreaths For Hope is excited to partner with the Beth C. Wright Cancer Resource Center for a great fundraising opportunity to help fund the fight against cancer! With this program, you can order a patented ribbon shaped wreath, crafted from the freshest Maine-grown balsam fir for yourself, a loved one, or in the memory of someone special. Remember to choose Beth C. Wright Cancer Resource Center as your organization and the Center will receive 20% of the purchase price! Choose a ribbon color, then choose the fundraiser code- Beth C. Wright Cancer Resource Center (BCW) listed in alphabetical order within the fundraising code box.Together we can help make a difference, one Wreath For Hope at a time!